Sapir College is located near the city of Sderot - a target of ongoing bombing by Hamas from Gaza. Despite the constant peril, life in the community goes on. It is one of several colleges in the Israel serving the local population for specialized needs and is recognized as one of the leading schools for film studies in the country. Many of its graduates are recipients of major national film prizes and its existence has enhanced the cultural life of the area as well as attracting talented students from around the country. Sapir College is also open to students from the Palestinian Authority. The student population adds to diverse personal narrative and quality of outcome. By bringing these various segments together, young people who might not normally interact with each other, work together with a common purpose providing conduits for mutual cooperation and respect. One of the highlights of the School is its sponsorship of an annual film festival. Held annually, the Cinema South Festival attracts close to 25, 000 from the south as well as other parts of the country. Films are screened at the Sderot Cinematheque, in the Bedouin city of Rahat, in some Kibbutzim and on campus. Unlike other festivals, films at the Cinema South festival are free to all the population. They are also translated into several languages, providing exposure of the medium to a broader public. Rotem 27, is a 4 year student, at the Department of Film and Television’s TV track Sapir College. Rotem has a sister and a father; she is originally from Jerusalem and now lives in a Kibbutz Brur Hail in the South. Rotem directed and shot the film ״Shabbat Shalom״. She received a scholarship from America-Israel Cultural fund, and set and shot the short film ״Two feet by,״ directed by Oriana Ben Aba which won second place at the Southern Minute computation, Cinema South Festival in 2009. Rotem with a touching personal story, visited on her own flesh, was ready and able to extend a hand to the other side and integrate her life with their lives. Please stop by and give us the opportunity to introduce you to one of the students who studies at the school with the option of visiting an exhibition of paintings, Cocktails and light refreshments. We’ll present two guest speakers, Robert Cancro MD Director of the International Committee Against Mental Illness and Chairman Emeritus of the NYU Department of Psychiatry and Matthew Lakenbach/Executive Director of the Middle East Peace Civic Forum. The development of the printing press gave birth to a revolution in communication and education by making information more broadly and readily available. As every neuropsychologist knows the impact of visual images is far greater than the impact of the printed word. Film is the printing press of our age. More than entertainment, film communicates information in the most persuasive and powerful fashion. Because of this persuasive impact, films can instruct or they can brainwash. Every modern dictator has understood the need to control the film industry as a means to shape public opinion. The International Committee Against Mental Illness (ICAMI) is dedicated to early detection and secondary prevention of mental illness. We believe that when stress exceeds the individual’s adaptive capacity mental illness results. Prevention involves the appropriate modulation of stress so as to harness its positive effects and to minimize its dangers. Here the potential power of film is vast. The Middle East has long been the Balkans of the Megreb. This film school’s location causes it to experience endless mortar and rocket attacks. Fear is an integral part of daily life for students and faculty. Yet, as is often the case with people, the human spirit triumphs over adversity and creative work goes on. Despite the horrendous conditions, the faculty educates and they with their students produce quality products that win awards and recognition. They make their films available to all individuals who wish to see them without charge. Those who cannot afford to pay are not excluded. The healing power of such creative activity is frequently under-recognized or even unrecognized. That fact that Jews and non-Jews study and work together is a seed that if tended can grow. Admittedly, it is a small arena of rational interaction but the creation of many such arenas can only be of value. Much of the hatred is stoked using the power of communication. It is through communication that we can hope to extinguish this dreadful emotion. Sadly, the relationship between Israelis and Palestinians has for too long been characterized by cycles of violence and revenge. Despite it all, the desire for peace, justice and reconciliation among the people of the region runs deep—in particular among young people. 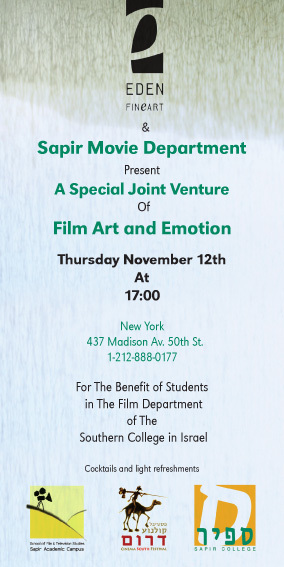 The Film and Television School at Sapir College brings together Arabs and Jews and provides them with training and opportunities to express both pain and possibility through creative expression. Located in the simmering conflict zone near Israel’s border with Gaza, the college represents the best of civil society in Israel. 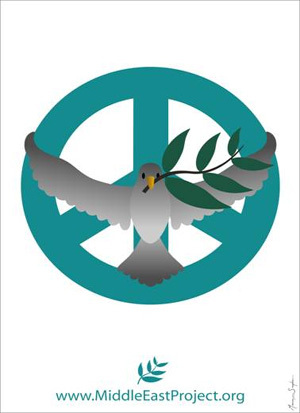 The Middle East Peace Civic Forum (MEPCF) works to raise the visibility and effectiveness of organizations like the Sapir School and other groups whose work lays the foundation for peace and reconciliation. We are proud to be a part of this event.